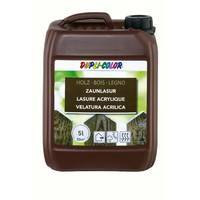 DUPLI-COLOR Fence lasure is a weather-proof wood paint for exterior premises. Without biocide. For all exterior wood constructions, such as wood fences, garden doors, palisades, pergola, garden houses, barns, piles etc. The areas to be painted have to be clean, dry, dust- and fat-free, firm and bearing. Old paintings: when intact clean and sand, otherwise with a paint remover. Remove without residues flaking, not bearing coatings. Prime: to prevent fungal attachs oder if parts have direct contact to the ground earth, use DUPLI-COLOR Wood impregnation. 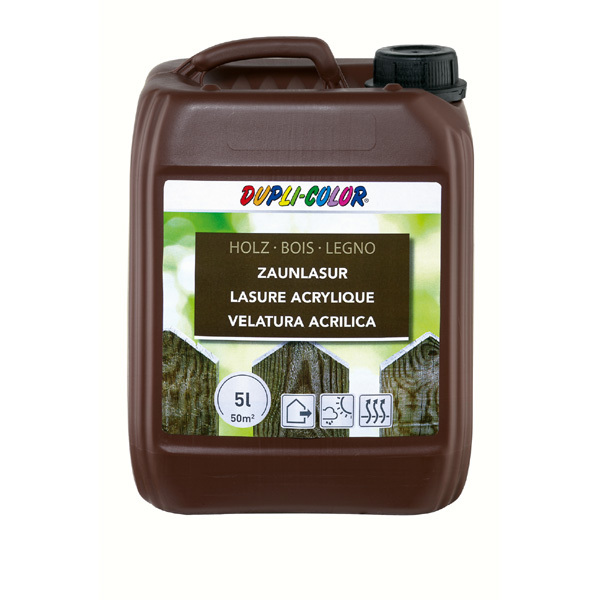 The colour of the wood influences the colour of the lasure, we recommend a test. After use immediately clean the tools with warm water and soap. Sand, clean and brush the wood always in direction of the fibers. In order to achieve an even, natural coat of paint, we recommend to apply several thin coast instead of one thick coat. Consider a drying time of 4 hours between the coats.